My husband, Mark, and I traveled to Tanzania in August of 2013 to climb Mt. Kilimanjaro and go on safari in order to cross a couple of items off our bucket list. We trained for months for our climb and digested every possible scrap of information we could find to help facilitate successfully reaching the summit. While I am pleased to report that we were successful in reaching Uhuru Peak and our safari was truly an amazing experience, what we didn’t anticipate or prepare for was the life-changing experience we encountered a few miles outside of Moshi at the Kilimanjaro Kids Care Orphanage. 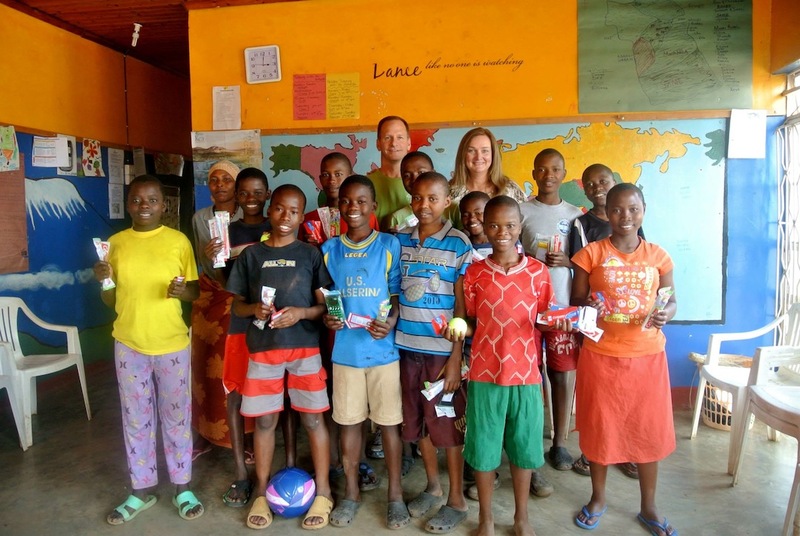 I stumbled upon Pack for a Purpose while checking out the Bristol Cottages website, the hotel where we stayed before and after our climb up Kili. (Which hotel, by the way, I would highly recommend.) I clicked on the Pack for a Purpose link and began to investigate what the organization was all about. Within a few minutes I had forwarded the link to Mark and we decided that we would definitely be packing for a purpose on our trip. We printed off the current list of needs at the orphanage and then decided that this would be a great mission project for our church to become involved in. I prepared a flyer, and for a couple of Sundays before we left for Africa I did an announcement in front of the congregation. Donations began to pour in. We not only filled up one huge suitcase, but two! We were so excited! We had 102 pounds of donations making the trip to Africa with us!! Since we arrived at the Kilimanjaro Airport on a Saturday evening and didn’t actually start our trek up Kili until Monday morning, I inquired with Gloria Moshi, the owner of Kindoroko Tours (who we booked our trip through and once again, I highly recommend), if she could arrange for someone from Bristol Cottages to take us to the orphanage on Sunday so we could deliver our supplies in person. Gloria graciously volunteered to take us herself — she picked us up on Sunday afternoon and personally drove us out to the orphanage, stayed there with us for the afternoon, and returned us to Bristol Cottages! When our car pulled up at the orphanage, we were immediately greeted by the smiling faces of children spilling out the front door. We were hugged over and over and over again. And not just any hugs. These were the kind of hugs where the kids just kind of melted into your embrace. Yes, we were already fighting back tears and we hadn’t even got through the front door! All the kids gathered in one of the rooms where the seats were arranged in a circle around the edge of the room. Each beautiful child stood up and introduced themselves in English — stating their name, how old they were and what they wanted to do when they grew up. Mark and I then introduced ourselves, and we were able to show the kids where we were from (Indianapolis, Indiana) on a map of the world that was painted on one of the walls. Gloria was a real blessing that afternoon. 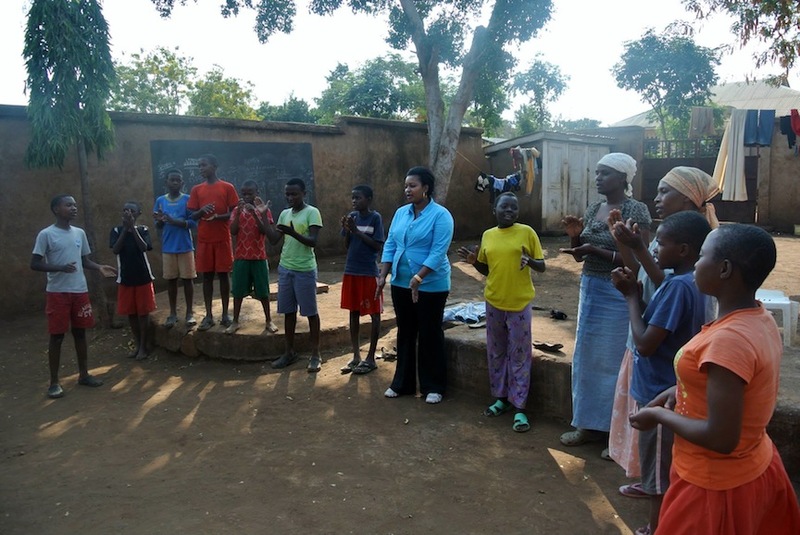 While the children spoke some English because they learn the language in school, the two women who stayed with the children at the orphanage did not. One of the items on the needed items list were medicines – Tylenol, cold medicines, vitamins, etc. We didn’t think about the directions on the medications being in English! 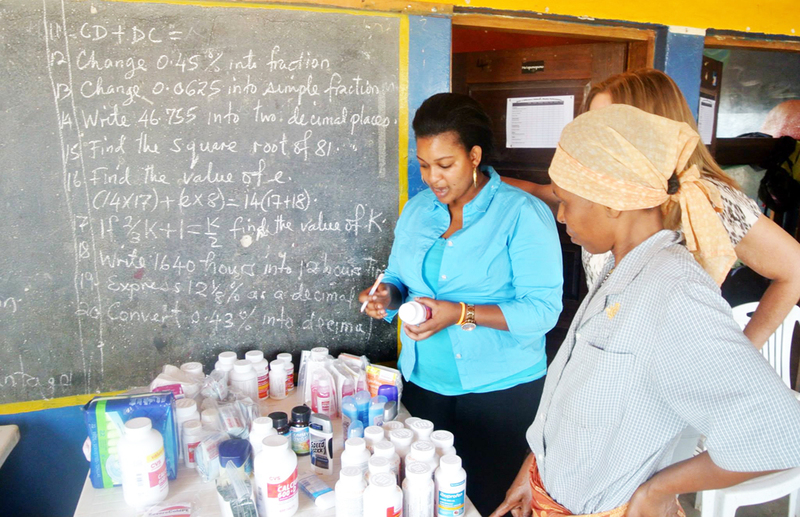 Gloria wrote down instructions in Swahili on each of the medications for the women. This was a huge help. We then began passing out all the other items to the kids. We had soccer balls, tennis balls, backpacks, lots of shoes in all different sizes for both boys and girls, personal care items, bath towels, solar calculators, pencils, pens, rulers, etc. Each child was so happy to receive something new, and lots of smiles and hugs were exchanged! After everything was passed out, the kids wanted to know if we would play football – soccer to us in the U.S. We had to break in those new soccer balls, you know! We spent the next couple of hours playing with the kids in the yard in back of the orphanage. We kicked the soccer ball around for a little bit, but quickly figured out that we were out of our league! Those kids can definitely play soccer! Being from Indiana where basketball reigns supreme, Mark spotted the basketball goal and felt more adept with that sport. 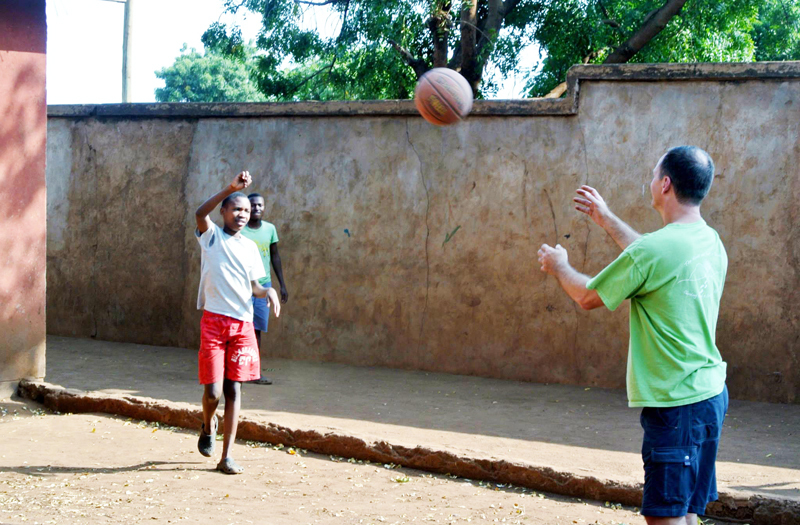 While Mark was shooting baskets with a few boys, a young boy named Peter wanted me to throw a soccer ball back and forth with him. Peter kept wanting to throw the ball faster and faster, and then we got two balls going back and forth at the same time. I think he likes to play goalie. Towards the end of our visit, we all gathered together in a circle in the backyard and the kids sang some songs for us. One song involved lots of repetitive clapping and dance moves. We tried our best, but I think the kids were pretty amused at the Americans with no rhythm! LOL! After the songs, one amazing young man stepped forward and spoke on behalf of all the kids. He spoke in English — very articulate for his age — and thanked us for the supplies we brought and for spending time with them. Once again, we found ourselves fighting back tears. 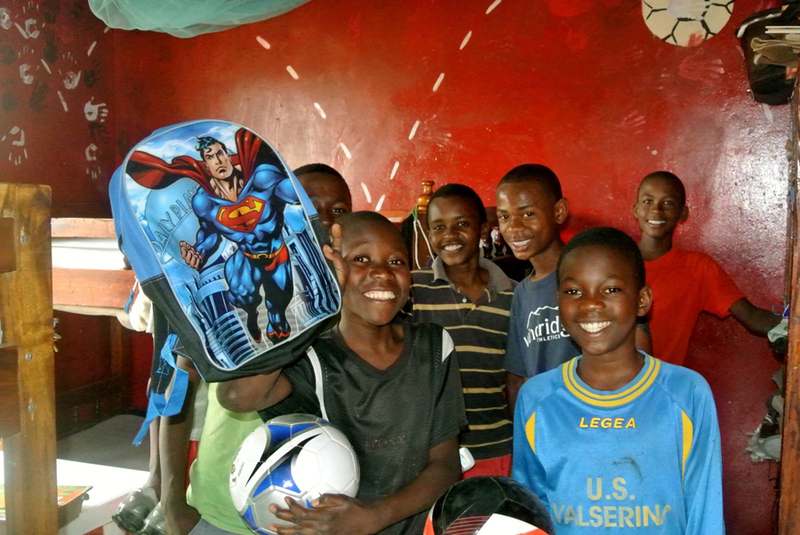 Even with the histories and hardships endured in their young lives, the kids at Kilimanjaro Kids Care Orphanage all have amazing spirit and hope. Their smiles are contagious. They are all good students and are working hard to make a difference not only in their own lives, but in the lives of other Tanzanians. I encourage you to take a moment to read their individual profiles on the Make a Difference website. I can truly say that our experience was life changing. The Kilimanjaro Kids Care Orphanage is now a part of my daily prayers. I think of the children’s bright smiles and warm hugs often, and we hope to be able to do more to help in the future. I hope those who read our story will also Make a Difference and Pack for a Purpose. Be sure to read about their amazing experience in Tanzania in Mark’s new book, “Beyond the Mountaintop,” which you can purchase on Amazon.